Loads.in — Find out how long it takes your website to load. Pipl.com — A search engine for finding people. This can be useful when you are trying to track down people for testimonials, etc. PrintWhatYouLike.com — Print precisely what you want from any webpage. RadioReference.com — Listen to radio channels across the nation. Could be useful in book radio talk shows. 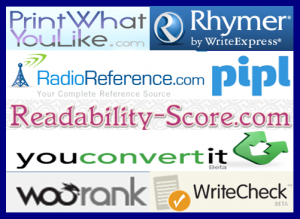 Readability-Score.com — Find out how readable your text is. Rhymer.com — Online rhyming dictionary for the poet in all of us. SearchTempest.com — Search all of CraigsList with one search. WakerUpper.com — Send yourself a wake-up call so you get started writing early. WooRank.com — Find out what your website is missing, how you can improve it, and how to make Google recognize it better. WriteCheck.com — Correct grammar and check for plagiarism. YouConvertIt.com — Convert documents into various formats. This can be very useful. Pipl.com — This people search engine can help you track down people for testimonials, etc.